João Flávio Nogueira Júnior1, Daniel Nogueira Cruz2. endoscopy, otological surgical procedures, dissection, middle ear. Introduction: The endoscope is an equipment used successfully in several procedures of several medical specialties. However, in the otology area, even with incorporation of endoscopes in joint procedures with microscope, the procedures purely assisted by endoscopy are still very limited. Objective: Our work is aimed at carrying out transcanal and modified transcanal endoscopic dissection of the middle ear, by showing important anatomic marks, as well as the structures that may be viewed through this access. Type of Study: Prospective. Methods: In May 2009, 10 parts of temporal bones were dissected by the same surgeon with the help of endoscopes. We used instruments from 0 to 45 grads and 4 mm, the same that were applied in nasosinusal surgeries. Results: There was no major technical difficulty performing dissections. We could identify several key-structures such as incudo-malleolar articulation, tympanic segment of the facial nerve, lateral semi-circular canal and additus ad antrum, all without provoking lesions in the middle ear structures. Conclusion: The middle ear endoscopic dissection by transcanal and modified transcanal ways is possible and enables an excellent view of important structures in the middle ear. The ear surgery techniques with endoscope are currently similar to the microscopic ones, but some instrument adaptation, new techniques and familiarization with such appliances are critical for the future procedures. The endoscope is an equipment used successfully in several procedures of several medical specialties. In our specialty, the endoscopes are extremely useful and currently they are very common for surgeries of nose, paranasal sinuses and cranial base. In these areas, the endoscope has practically replaced the microscope for it offers some advantages, such as the excellent viewing of structures, large angular image, viewing in several angles and magnification that enable the performance of complex surgeries (1). However, in the otology area, even with incorporation of endoscopes in joint procedures with microscope, the surgeries purely assisted by endoscopy are still very limited (2, 3, 4). Today, the surgical procedures of the middle ear are traditionally carried out with the help of microscopes. On the other hand, in spite of some benefits, because of its restrict and linear view field, the microscopes do not allow an easy viewing of deep and lateral recesses of the middle ear. Exactly due to the limitations inherent to the microscope, the conventional microscopic surgical techniques require exposure for viewing these areas very often by using accesses that require drilling of structures in addition to retroauricular incisions (2, 5, 6, 7). In spite the endoscope does not offer a three-dimensional view currently, it offers a wide view field and with a power of magnification even higher than that of some microscopes. Currently, such equipment is already used for diagnosis in outpatient services or for surgical complementation, like in cases of inspection of possible residual cholesteatoma; however, the surgical use of endoscopes in otology is still very restrict and their application in most cases is merely secondary to the use of microscopes (4, 5, 7, 8). Our work is aimed at presenting the technique of transcanal endoscopic dissection of the middle ear, by evaluating essential areas and anatomic marks that may be accessed through this access and discussing the main technical difficulties found. - Endoscope: instruments of 4mm and 18 cm from 0 to 45 degrees, the same instruments used in traditional surgeries of nose and paranasal sinuses (Figure 1B). - Video: camera with three chips (Stryker 1088HD), with halogen light source of 150 watts. - Instruments: traditional material of otological surgery with tweezers, curettes, elevators and aspirator for ungluing specially built (Figure 1A). - Positioning: the temporal bones were positioned in a suitable tray and dissection was made with the surgeon directly viewing the monitor that remained before him. A transcanal and modified transcanal endoscopic dissection protocol of the middle ear with anatomic marks and structure that should be viewed was developed. The dissections were based on this protocol and all were carried out by the same surgeon. All the temporal bones chosen presented an intact tympanic membrane. The external auditory meatus was cleaned for removal of any objects that could damage the insertion of the endoscopes. The endoscopic dissection started with an instrument of 4mm and 0 degrees. A large tympanomeatal piece was made and exposed the middle ear. At this point in all parts the following structure should be viewed: promontory, round and oval windows, long branch of the incus, stirrup, cochleariform process, tympanum tensor and facial nerve. After viewing of these structures, a curettage was made on the posterior wall of the external auditory meatus which was to expose the nerve of the chorda tympani, stirrup tensor and pyramidal eminence (Figure 2). The next step was the performance of curettage in the attic region and the incudo-malleolar joint should be viewed. After viewing of such structure with an endoscope of 4mm and 0 degrees, an inspection of the middle ear was made with an endoscope of 4mm and 45 degrees. With this angular instrument, it should be possible to view the Eustachian tube, tympanum tensor muscle canal, facial nerve recess, lateral semi-circular canal and the entry to the mastoid antrum (Figures 3 and 4). The tympanic membrane, hammer, incus and stirrup were then removed, which exposed the middle ear totally. At this point another inspection with endoscope of 4mm and 45 degrees was made. Figure 1. Instruments used. A: Traditional material for otological surgery added to curettes and specially built aspirator for ungluing. B: Endoscopes of 4 mm and 18 cm (0 and 45 degrees of angulation). Besides these, traditional aspirators, tweezers and scissors are also required. Figure 2. Ear endoscopic dissection. A: Endoscopic view (0 degrees and 4mm) of the middle ear, after curettage of the posterior wall of the external auditory meatus and removal of the chorda tympani nerve. B: The same view edited with colors for a better identification of some structures. MT: tympanic membrane. P: promontory. E: stirrup. TE: stapedius tendon. EP: pyramidal eminence. RLB: incus long branch. NF: facial nerve tympanic segment. PC: Cochleariform process and tympanum tensor. Figure 3. Ear endoscopic dissection. A: Endoscopic view (45 degrees and 4mm) of the middle ear, after curettage of the posterior wall of the external auditory meatus and removal of the chorda tympani nerve and beginning of the attic region curettage. B: The same view edited with colors for a better identification of some structures. MT: tympanic membrane. P: promontory. JR: round window niche. B: incus. M: hammer and beginning of viewing of the incudo-malleolar joint. NF: facial nerve tympanic segment. PC: Cochleariform process and tympanum tensor. Figure 4. Ear endoscopic dissection. A: Endoscopic view (45 degrees and 4mm) of the middle ear. B: The same view edited with colors for a better identification of some structures. PC: Cochleariform process and tympanum tensor. P: promontory. E: stirrup. TE: stapedius tendon. RLB: incus long branch. NF: facial nerve tympanic segment. CSL: lateral semi-circular canal and entry to the mastoid antrum. All 10 temporal bones were dissected with the help of endoscopes of 4mm of diameter and 18 cm of length. There were six bones at the left side and four at the right side. The main technical difficulties found were the handling at some moments of the endoscope and of instruments inside the external auditory meatus. Nevertheless, despite these, there were no major technical difficulties, such as (unintentional) lesion caused by the tip of the endoscope on important structures of the middle ear and the external auditory meatus upon endoscopic-assisted dissection. All the abovementioned structures were viewed successfully through this access way with the use of angular endoscopes or endoscopes of 0 degrees. Besides these structure, we found an excellent viewing of the tympanic segment of the facial nerve, lateral semi-circular canal, mastoid antrum, tympanum tensor muscle canal and Eustachian tube (Figures 5 and 6). Figure 5. Ear endoscopic dissection. A: Endoscopic view (45 degrees and 4mm) of the middle ear after removal of the tympanic membrane and ossicular chain. B: The same view edited with colors for a better identification of some structures. NF: facial nerve tympanic segment. CSL: lateral semi-circular canal. AM: entry to the mastoid antrum. Figure 6. Ear endoscopic dissection. A: Endoscopic view (45 degrees and 4mm) of the middle ear after removal of the tympanic membrane and ossicular chain. B: The same view edited with colors for a better identification of some structures. TA: Eustachian tube region. CTT: tympanum tensor muscle canal. PC: cochleariform process and tympanum tensor muscle tendon. Although the endoscopes are already used in our specialty for at least 15 years, in otology the use of such instruments is still very restrict (2). One of the main reasons may be the role of prominent otologists who indicate the use of endoscopes only for secondary procedures and those limited to diagnosis. In addition, to modify traditional techniques with excellent results and universally accepted with the use of microscopes and adaptation to the work with only one hand is difficult. Another factor may be the use of endoscopes with a lower diameter in otology. Such instruments may be very frustrating for surgeons because perhaps the sole advantages of the endoscopes are the different angulations and a broader view field, which is not reached with such "otological" endoscopes with a lower diameter and length. Moreover, the minor endoscopes often do not enable the suitable handling of the instruments, since many times there is a limited space for hands moving, which does not happen with the use of endoscopes of 4mm and 18 cm of length (2, 9, 10, 11, 12). Most authors state that the stronger contribution of endoscopes for otological surgeries would be that of the treatment of cholesteatomas (6,7,8,9,12). The transcanal and modified transcanal accesses to the tympanic cavity have been receiving special attention by those who indicate endoscopes for the treatment of such lesions and with excellent results compared to the traditional microscopic accesses (2, 3, 4, 6, 7, 8, 9, 12). We carried out endoscopic dissection by using instruments of 4mm and 18cm that enabled a better view than those obtained with the otological endoscopes. Such instruments are the same as used in traditional surgeries of nose and paranasal sinuses. The use of nasal endoscopes in otological surgeries is a very recent subject. Most authors who suggest the use of endoscopy for otological surgeries use traditional ear endoscopes (2, 3, 4, 9, 13). We did not find any problem neither with the diameter nor the space occupied in the external auditory meatus by the instrument. The dissection was based on transcanal and modified transcanal accesses. Some technical difficulties were verified by the surgeon who performed the dissections, such as absence of three-dimensional stereoscopic view and monomanual work. However, key structures for the accomplishment of safe and effective otological surgeries were found, and there were no major technical difficulties. It is important to mention it is a study on anatomic parts without bleedings. Despite such limitations, the excellent endoscopic viewing of the middle ear structures may become a promising future for the ear endoscopic surgery. For the capacity of endoscopic view of some structures, lesions limited to the attic region may be accessed by the external auditory meatus with the help of endoscopes. In the anatomic study we could identify the incudo-malleolar joint, as well as the tympanic segment of the facial nerve, lateral semi-circular canal and entry of the mastoid antrum, all without provoking any lesions on structures of the middle ear. However, extensive lesions may present with a difficult management with endoscopes. The use of endoscopes in otological surgeries is still limited, but after the dissection study, we began to carry out otological surgeries exclusively with endoscopes for myringotomies, stapedotomies and surgical treatment of cholesteatomatous otitis media (Figures 7 and 8). Figure 7. Exclusively endoscopic myringoplasty. 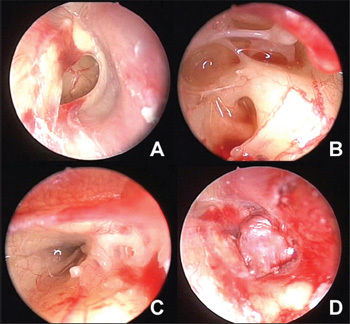 A: Endoscopic view (0 degrees and 4mm) of perforation in the right tympanic membrane. B: Endoscopic view (45 degrees and 4 mm) of the middle ear through tympanic perforation. Note the view of stirrup, stapedius tensor, pyramidal eminence, round window, facial nerve tympanic segment part and middle ear recesses. This kind of view would not be possible with the use of microscope. C: Endoscopic view (45 degrees and 4mm) of the Eustachian tube through tympanic perforation. D: Closure of the tympanic perforation. Figure 8. Exclusively endoscopic stapedotomy. 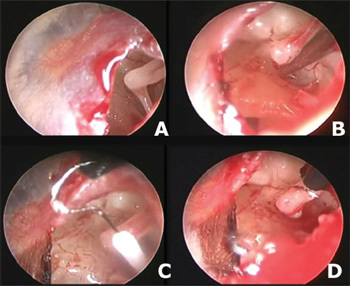 A: Endoscopic view (30 degrees and 4mm) of perforation created in the left tympanic membrane. B: Endoscopic view (30 degrees and 4 mm) after fracture and removal of the stirrup superstructure. Note the incus long branch and the oval window niche (with the stirrup plate). C: Placing of the prosthesis. D: Prosthesis in place. The middle ear endoscopic dissection by transcanal and modified transcanal ways is possible and enables an excellent view of important structures in the middle ear. The ear surgery techniques with endoscope are currently similar to the microscopic ones, but some instrument adaptation, new techniques and familiarization with such appliances are critical for the future procedures and the popularization of the ear endoscopic surgery. 1. Higgins TS, Courtemanche C, Karakla D, Strasnick B, Singh RV, Koen JL, Han JK. Analysis of transnasal endoscopic versus transseptal microscopic approach for excision of pituitary tumors. Am J Rhinol. 2008, 22:649-52. 2. Tarabichi M. Endoscopic management of cholesteatoma: long term results. Otolaryngol Head Neck Surg. 2000, 122:874-81. 3. Tarabichi M. Endoscopic management of acquired cholesteatoma. Am J Otol. 1997, 18:5444-9. 4. McKennan KX. Endoscopic "second look" mastoidoscopy to rule out residual epitympanic/mastoid cholesteatoma. Laryngoscope. 1993, 103:810-4. 5. Rosenberg SI, Silverstein H, Willcox TO. Endoscopy in otology and neurotology. Am J Otol. 1994, 15:168-72. 6. Tarabichi M. Endoscopic middle ear surgery. Ann Otol Rhinol Laryngol. 1999, 108:39-46. 7. Barakate M, Bottrill I. Combined approach tympanoplasty for cholesteatoma: impact of middle-ear endoscopy. J Laryngol Otol. 2008, 122:120-4. 8. Yung MW. The use of middle ear endoscopy: has residual cholesteatoma been eliminated? J Laryngol Otol. 2001, 115:958-61. 9. Tarabichi M. Endoscopic management of limited attic cholesteatoma. Laryngoscope. 2004, 114:1157-62. 10. El-Guindy A. Endoscopic transcanal myringoplasty. J Laryngol Otol. 1992, 106:493-5. 11. Kakehata S, Futai K, Sasaki A, Shinkawa H. Endoscopic transtympanic tympanoplasty in the treatment of conductive hearing loss: early results.Otol Neurotol. 2006, 27:14-9. 12. El-Meselaty K, Badr-El-Dine M, Mandour M, Maurad M, Darweesh R. Endoscope affects decision making in cholesteato-ma surgery. Otolaryngol Head Neck Surg. 2003, 129:490-6. 13. Karhuketo TS, Puhakka HJ. Endoscope-guided round window fistula repair. Otol Neurotol. 2001, 22:869-73. 2. Resident Doctor of Otorhinolaryngologist at the Federal University of São Paulo - UNIFESP. Institution: Instituto de Otorrinolaringologia e Oftalmologia de Fortaleza - IOF Sinus Centro. Fortaleza / CE - Brazil. Mail Address: João Flávio Nogueira - Rua Dr. José Furtado, 1500 - Fortaleza / CE - Brazil - Zip code: 60822-300 - Telephone: (+55 85) 9987-6234 - E-mail: joaoflavioce@hotmail.com. Article received on October 25 2009. Approved on December 2 2009.